I confess: I never heard of Scott Jurek before I read Born to Run. I imagine most serious runners would cringe if they heard that, but my excuse is that I didn't take running seriously before I read Born to Run. I’m also guessing there are many people out there who share my experience. Regardless of when or how I learned about the guy, he quickly became my running idol. This is the man who won the Western States 100 an unprecedented seven times consecutively, and set a new course record. That makes him the Lance Armstrong of ultrarunning (minus the drugs). He also ran the extremely difficult Hardrock 100 with a sprained ankle that had swollen to the size of a cantaloupe even before the race began. He not only finished, and not only won, but also set a new course record. Not enough? In 2005, Jurek entered the brutal 135-mile Badwater race across Death Valley. He fell into fifth place several miles behind the leader and collapsed dry heaving, unable to bear the heat. He said he was done and couldn’t even stand up. Then he cleared his head, pulled himself together and started running. He not only came in first place but—you guessed it—set a new course record. Sorry for the spoilers, but I’m assuming that most people who pick up his recently released book are doing so because they already heard these stories. Not to mention the one that gave him a new wave of fame outside the world of ultrarunning: Jurek was the man who gave the Tarahumara champion, Arnulfo Quimare, a run for his money at the first Copper Canyon Ultramarathon. That epic race, documented climatically in Born to Run, introduced westerners to the Tarahumara (or Rarámuri) super athletes on their own turf. It also, in turn, fueled the barefoot running revolution and inspired many couch potatoes to get off their butts and start training. Suffice it to say, Scott Jurek has led a heck of a life. It’s no wonder so many runners portray him in a god-like status. And now you can hear the story from his perspective. No, Eat and Run is not an ultra training manual, although it is full of running tips. And no, it’s not a cookbook, although it is full of recipes. It is an autobiographical account of a life that has been driven by running and food. Jurek came from humble beginnings. He was a poor kid from a poor family in Minnesota. He began running only to train for competitive skiing and with the help of his lifelong friend, Dusty, learned to push himself past limits that would have made most people give up and crawl back into bed. His childhood was burdened by his mother’s degenerating health and his father’s unforgiving work ethic. “There are some things you just do,” one of his father’s favorite phrases, became a mantra that compelled Jurek to keep running on long trails—despite a falling-out with his dad. As he begins to enter the world of ultrarunning, Jurek quickly evolves from an unknown “flatlander” to a running legend. He’s well-known for his friendly camaraderie, often chatting with people on a race and waiting by the finish line for a day or two after he finishes just so he can congratulate every single runner that follows him. But his story also shows a different side. This is the competitive Jurek who strives to crush race records and jumps at every opportunity to mentally psych-out runners who threaten him. There’s a lot of foul language on the trails (mostly from Dusty, who runs as his pacer) and Jurek holds none of it back in the story. No, this doesn’t make him out to be a bad guy, but shows he really is human. He explains very well how the loneliness and competition of trails works ironically as a strong bonding experience for all runners in an ultra. And his very competitive nature is balanced by his training in Bushido and other Eastern practices that give him peace of mind and a deep, somewhat spiritual appreciation of running. His descriptions of the state of mind he sometimes achieves on a long run motivate me to hit the trails more than anything else, to find what he describes as “a place where worries that seemed monumental melted away, where the beauty and timelessness of the universe, of the present moment, came into sharp focus” (p. 181). So where does the “eat” part come in? 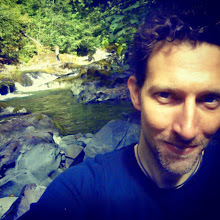 It’s no secret that Jurek is a devout vegan, and he often attributes his running success in part to his diet. He made the transition from burgers and fast food to fresh vegetables and quinoa slowly as a young man. After running and barely losing his first few ultras, he came to the conclusion that he couldn’t possibly have run harder, so there must be something else that was holding him back. Cutting out animal protein (and later dairy) made a noticeable difference. I also have to add that he gives one of the most compelling arguments I’ve heard for going vegetarian/vegan: instead of trying to cut out foods you like, work on developing awareness for how different foods make your body feel and your diet will change naturally. Every chapter ends with one of Jurek’s favorite vegan recipes, including such delicacies as Minnesota Winter Chili, Chocolate Adzuki Bars and Green Power Pre-Workout Drink. Scott Jurek preparing a home-cooked vegan stir fry. The story takes us almost to the present day, and the past few years haven’t been easy for the legend. 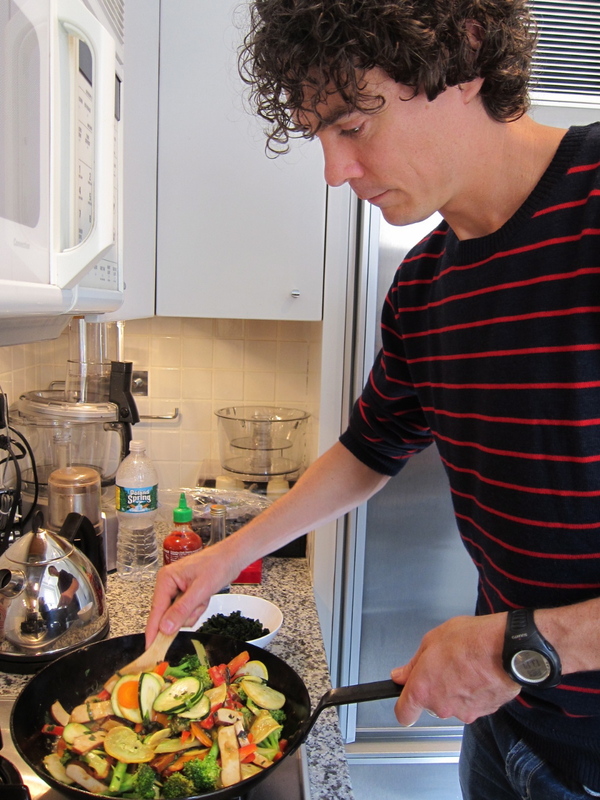 Personal drama, the ailing health of his mother, running injuries and growing older all take their toll and show that Scott Jurek’s life may not be as enviable as many would like to think. He’s quick to say that running is more of a mental challenge than a physical one, and he shows just how true that is when he faces hard times in his personal life. Emotional challenges affect not only his ability to run but also his reason to run. Suffice it to say, the book finds a satisfying closure to an amazing life, at least up to the point where it now stands. And when it was over, I was sad to put it down. Every chapter was an exciting page-turner, easy to read and fun to experience. I have trouble seeing Jurek as a god now because he showed his human side raw and uncensored. His accomplishments are nothing less than spectacular, but at the heart of it all he’s still the skinny kid from Minnesota. 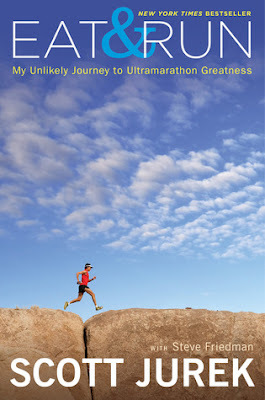 I learned recently that Scott Jurek, now 39, is returning to ultrarunning after a hiatus and book tour, and is training for the Leadville 100 race this August. No doubt, many people will be following him with close attention. Personally, I’m excited to know that his story still continues.